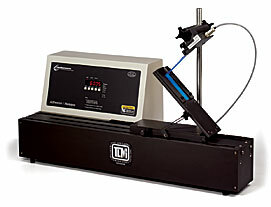 The most versatile peel tester on the market, the ChemInstruments Adhesion/Release testing machine with digital display is designed to perform PSTC, ASTM, TLMI, FINAT and AFERA adhesion and release testing procedures. 美国ChemInstruments 公司研制的AR-1000剥离强度/离型强度测试仪,符合欧美及其它国际的测试标准, 例如PSTC, ASTM, TLMI, FINAT 及 AFERA等测试标准. 该机附有数字显示器及多种测试功能, 具目前同类产品之最. Copyright 2011 Kensinger Group Inc. All rights reserved.